Another of Johannes Hevelius' creations, it commemorates the Sextans Uraniae, or sextant. It is an instrument with a calibrated arc, called a limb, that measures up to 60°, one sixth of a circle. Models of Hevelius' day measured the angular distance of a star (including the sun) to the horizon. Invented independently by the American, Thomas Godfry, and the Englishman, John Hadley in 1730, it teamed up with the chronometer after 1764, allowing navigators at sea to know both latitude and longitude. John Harrison perfected the chronometer's design that year in England, achieving an accuracy of .1 second per day, regardless of temperature fluctuations. 48k JPEG NGC3115 (Bennett 42, Best 88, Caldwell 52) is called the "Spindle Galaxy." Dreyer calls this lenticular galaxy very bright (mag. 9.7), large (8.3'x3.2'), very much elongated (P.A. 46°), and brightening sharply to a brightened, elongated nucleus. It lies 4.8° north of Lambda Hydrae. 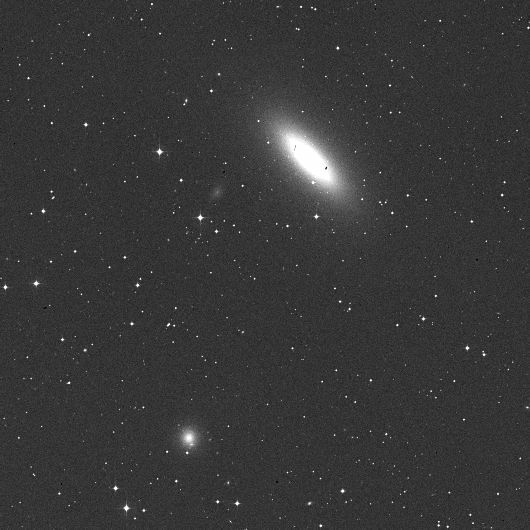 The other significant galaxy in the lower, left (south-east) of the photograph is the lenticular MCG-1-26-21 (mag. 13.5).